is an archipelago of 104 islands lying in the north western coast of Peninsular Malaysia. The Langkawi archipelago consisting of 104 islands in the Andaman seas is an ecologically-rich and complex site. Known as the “Jewel of Kedah”, the exact location of these tropical islands is at the site where the Straits of Malacca meets the waters of the Andaman Seas. The largest of these islands is called Langkawi Island while the other islands in this group include Pulau Dayang Bunting (Isle of the Pregnant Maiden), Pulau Singa Besar and Pulau Beras Basah. Recognised as a Unesco Global Geopark, it has over 90 significant sites identified for geological and ecological significances. This amazing geological history has resulted in a spectacular diversity in flora and fauna, a true naturalist haven and with more than 220 bird species – a birdwatcher’s delight! At the beautiful coastal habitats you might find the Plain-backed Sparrow, Red-wattled Lapwing, Malaysian Plover, White-bellied Sea Eagle, Crested Serpent Eagle, Oriental Pied Hornbill, Pink-necked Pigeon, Pied Fantail, Greater Racket-tailed Drongo, Copper-throated Sunbird, White-throated and Collared Kingfishers. In the mangrove swamps, you might spot the rare Brown-winged Kingfisher and Mangrove Pitta. During winter, many migratory birds make the Langkawi islands their home including the Grey-faced Buzzard, Cattle Egret, Intermediate Egret, Common Kingfisher, Ruddy Kingfisher, Black-capped Kingfisher and the Ashy Drongo. One of the best places for forest birds is Gunung Raya, which is accessible by road right up to the peak. Here, you will be mesmerised by the magnificent sight of Great & Wreathed Hornbills, which sometimes congregate in large numbers on a fruiting tree. Other forest birds include the Mountain Hawk Eagle, Large Green Pigeon, Black-hooded Oriole and the Blue-winged Pitta. 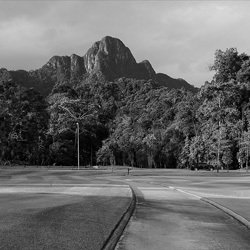 Langkawi is also regarded as the “Hornbill Island of the World”. Pristine, breathtaking and exciting, birdwatching at the Ulu Muda Forest Reserve is for those with a thirst for adventure. Comprising a cluster of several forest reserves, it is by far the largest at 115,000 sq km. 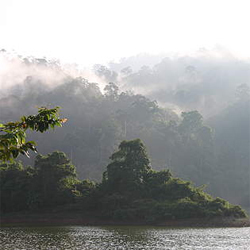 Made up of Lowland Dipterocarp Forest, Hill Dipterocarp Forest and the Upper Hill Dipterocarp Forest, the Ulu Muda Forest Reserve has an elevation range from about 97m to the highest point of 1256m. The area is particularly known as an important site for Malaysia’s mega fauna including the Asian elephants, Malayan tapirs, sambar deers barking deers, gaurs, tigers and panthers, and home to about 195 species of birds. Explore jungle trails, rivers, limestone hills, caves, and saltlicks while you enjoy boat rides and observe wildlife during your stay in this magnificent forest. Nine hornbill species including the Great Hornbill, Helmeted Hornbill, Rhinoceros Hornbill and Wreathed Hornbill, 9 species of woodpeckers and 5 species of kingfishers. The elusive Masked Finfoot has been seen around the Lake Ulu Muda while the extremely rare Dusky Eagle Owl has been sighted along the upper reaches of the Muda River. Popular birdwatching spots include Lake Ulu Muda as well as trails and paths at Pengkalan Labua (Labua Camp). 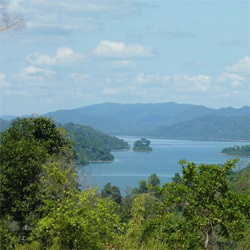 Lake Pedu, a beautiful man-made lake is located close to the Thai border, at the Padang Terap district in Kedah. Formed by the Pedu dam, the lake covers an area of 75 sq km but fluctuates according to the season. It’s surrounded mainly by lowland forests and has amazing bird diversity. More than 200 bird species have been observed here. One of the better bird watching spots is located at the last few kilometers of the tree-lined road leading to the accommodation area. The forest and trails that surround the lake are excellent for birdwatching especially during early mornings and late afternoons. It is advisable to pack your lunch and drinks when planning to stay for the whole day. During the fruiting season, birds often come to feed on fruits of the trees that surround the lake. Some of the interesting birds include the Gold-whiskered Barbet, Black Hornbill, Crested Serpent Eagle and the Scarlet-rumped Trogon. During the migration season from October to November, migrating raptors, such as Honey Buzzards and Sparrow Hawks can be spotted.